There are a billion reasons to love and hate chess. Pawn Sacrifice seeks to highlight justifications for both ends of that spectrum. 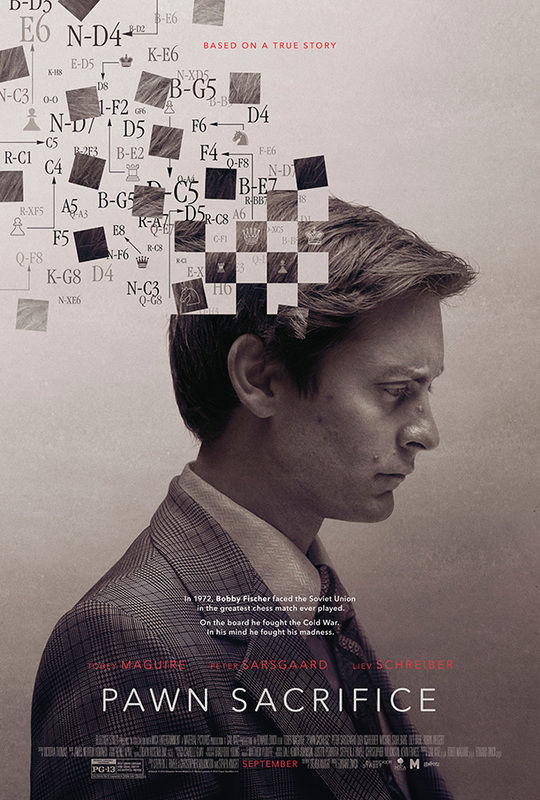 Tobey Maguire (Bobby Fischer) escaped into the legendary chess player for a movie he said was 10-years in the making. For most people (including myself), Bobby Fischer is the one name we know in the chess universe. Most notably, this stems from a film in which a 7-year old boy from a middle-class family in New York City found himself inadvertently “searching” to channel Fischer’s world-renowned skill in the 1993 classic, Searching for Bobby Fischer. In a recent interview, Tobey Maguire revealed just how difficult chess is to play, let alone succeed against the best. The mental toll, if pushed to the highest levels, is enough to drive any sane person mad. This is one of the driving forces in Pawn Sacrifice, which is based on a true story. However, the psychological illness caused by the strenuous nature of chess didn’t stop Maguire from relishing in the blind luck mastery of today’s chess champion. Whether you have to drive diagonally across town, north and then west or straight up the road, seeing Pawn Sacrifice this weekend seems like a worthwhile move. That makes total sense for fans of the powerful 1993 movie, Searching for Bobby Fischer, which was based on the true story of a young prodigy’s pursuit towards reaching the chess status of the legendary player. The poster above is Tobey Maguire, who will be portraying the chess champion in the film, Pawn Sacrifice. The movie is due out in September of this year. Even without a trailer, this poster alone will likely spark quite a bit of buzz because of the naturally intriguing enigma of chess and, perhaps, the equally enigmatic mind of a master chess player. As is custom with anyone considered a genius (no matter the profession), people are captivated to understand how and why these individuals think the way they do. Bobby Fischer is no exception. Pawn Sacrifice will have a couple hours to reach an entertaining checkmate with the audience. Hopefully, the movie makes the right gambit.